Vaginal prolapses are often confused with vaginal hyperplasia, also known as vaginal edema. So the first thing to do is make sure it is a prolapse. Vaginal hyperplasia is treated by removing the protruding tissue surgically. 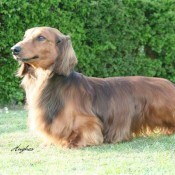 Vaginal prolapse is more difficult to treat if retaining breeding ability is desired -- although this is considered to be a possibly inherited trait so there is some question about the advisability of breeding. Ovariohysterectomy (spaying) is usually curative. Some prolapse will regress on their own as the dog goes out of heat but it probably isn't a good idea to count on that if there is a significant prolapse. I have seen recommendations for treating this with gonadotrophic releasing hormone but do not know of the success rate. Surgical repair by entering the abdomen, retracting the prolapse and suturing the uterus to the body wall may work but it does make future breeding questionable and possibly even dangerous.